I set up my blog in October and actually told people it existed in December...I needed to figure out what I was doing first and be sure it was something I could do before I told anyone about it :-) So now 10 months later, I have developed some great new friends and readers. So it seemed only fitting to do my first blog candy give-away. 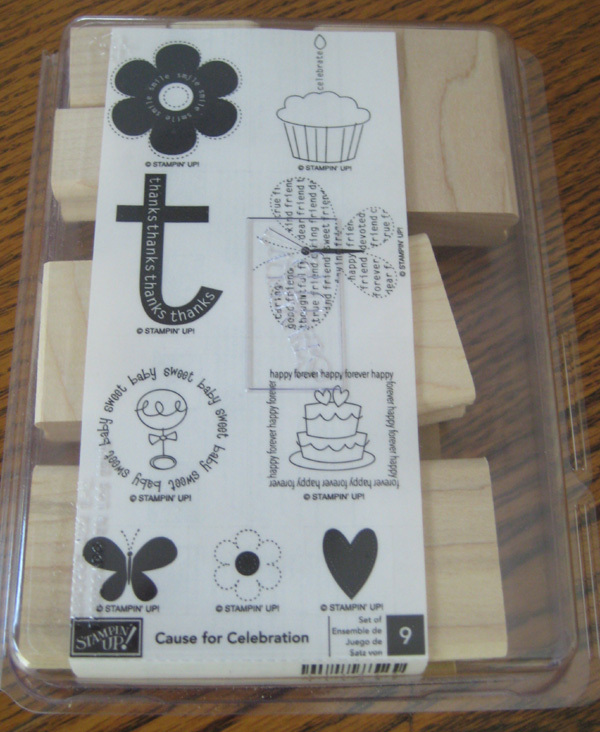 Leave a comment on any post, past or future, by September 10 and be entered into a random drawing for this retired stamp set Cause for Celebration. This was one of our Stamp-a-Stack cards in August and yet another great sample I saw on the display boards at convention. 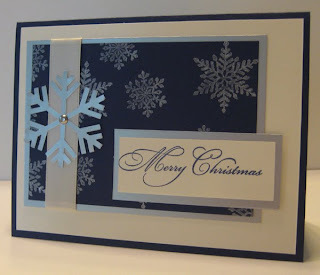 It uses Crumb Cake and Not Quite Navy with Whisper White craft in and our white gel pen. I just love the style of this card and wish I could credit the actual creator. I loved the swap I received from Heather Wnek at convention. 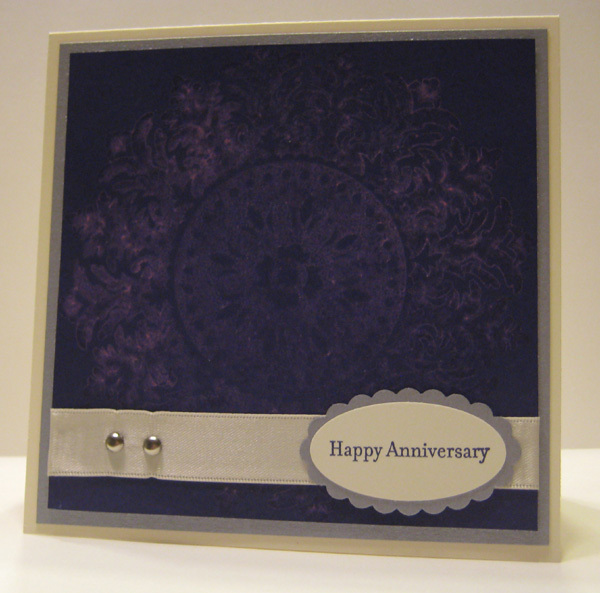 Her original card was 3 x 6 but I changed the size for my August stamp-a-stack to 4 1/4 x 5 1/2. It uses Early Espresso, Blushing Bride, Pear Pizzazz and Very Vanilla. I got so many great swaps but this design was truly one of my favorites. This card was inspired by a card I saw at convention. 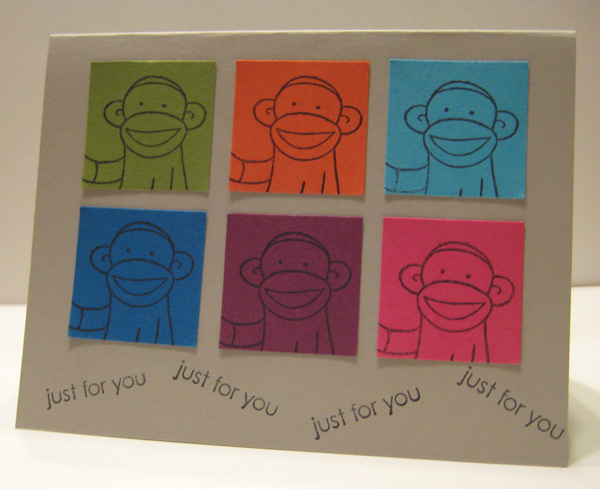 I loved the Andy Warhol style, and when I saw the card, I knew I needed to do something similar for a friend's August birthday. Her card was late, but I am sure when she received it, she understood the hold up. 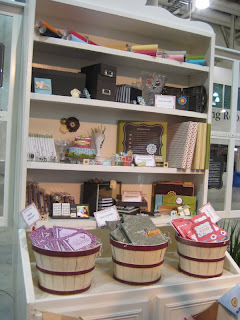 It is so hard to narrow down my choices and place that first order when new catalogs and mini catalogs come out. So until now, I had resisted ordering the builder wheel spindle and spacers. But now that I have, I already have my next order in for more uninked cartridges. 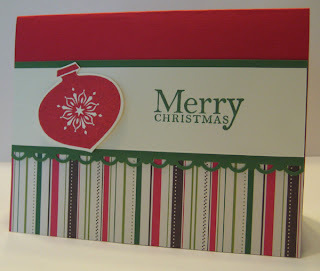 This makes a quick card, wrapping paper, or scrapbook background. You get uninked cartridges and create your color combinations with your reinkers. This one is Tempting Turquoise, Rich Razzleberry, and Pumpkin Pie. 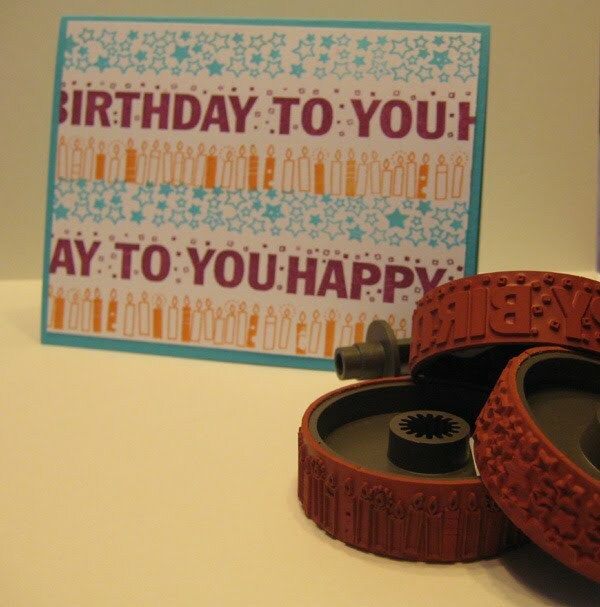 But you could also use a solid ink cartridge or even use the spacer to create different designs. I am looking forward to creating Christmas projects with some of the new designs coming out in the Holiday Mini Catalog in September. I call this a circle card. I am not sure if that's what it is really called, but that's what I am going with until I learn differently :-) We did this in club last week and I thought this fantastic flower needed a slightly "fancier" card base. Using the scallop circle and the Big Shot, cut two and attach them with a jumbo eyelet. 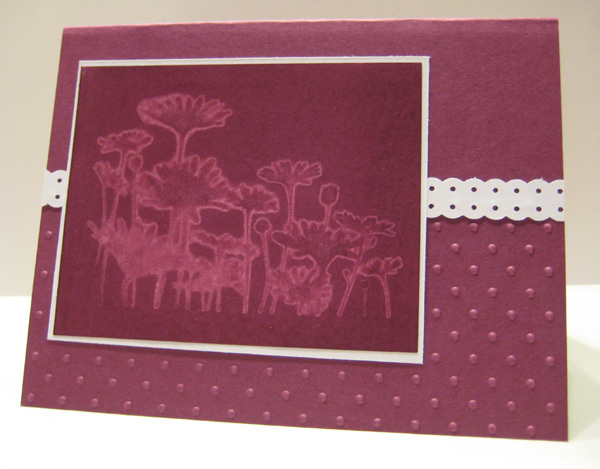 Be careful not to squeeze the Crop-a-dile too tightly because we want the card to swing open to reveal your greeting. 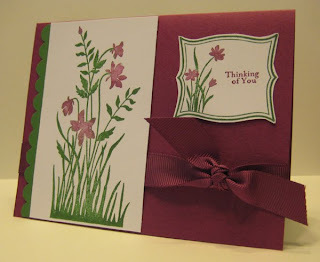 You can find the directions for this flower at www.simistamper.blogspot.com/2010/02/instructions-for-paper-rose.html. Thanks to Rae Anne for finding these directions and teaching me this flower. The Because I Care set is perfect for the bleaching technique. We made this one in stamp club last week by embossing with clear embossing powder and using a Q-tip to lightly rub bleach over the flower. Try it with different colors of cardstock because they don’t all bleach the same way. I had quite a stamping weekend! A couple demonstrator friends and I went to the Chicago suburbs to a meeting Thursday night. The bonus for us was that we stayed with another demonstrator friend that we don't get to see very often. We had a great time together, got some good stamping ideas and hit the IKEA store on the way home. We got back to Champaign with enough time to turn around and go to our post-convention ImPECKable Stampers meeting. 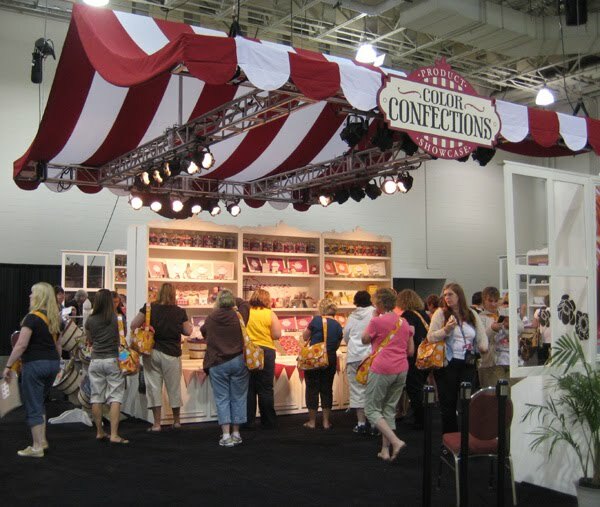 Those of us who attended convention shared our favorite moments, demonstrated some of the new things we saw at convention and did a fun make-n-take. Then on Saturday, I came home and went to a 2nd grader's birthday party. The 8 girls made purses with the birthday girl's favorite colors and got to fill it with goodies when they were done. I thanked the hostess for helping me "warm up" for next week when school starts. 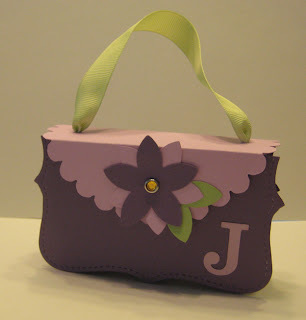 Here's a peek at the birthday party purse and at my swap. For the swap I used my new stamp set, Just Believe, which I received free at convention. The medallion technique has been a lot of fun for me to try out. 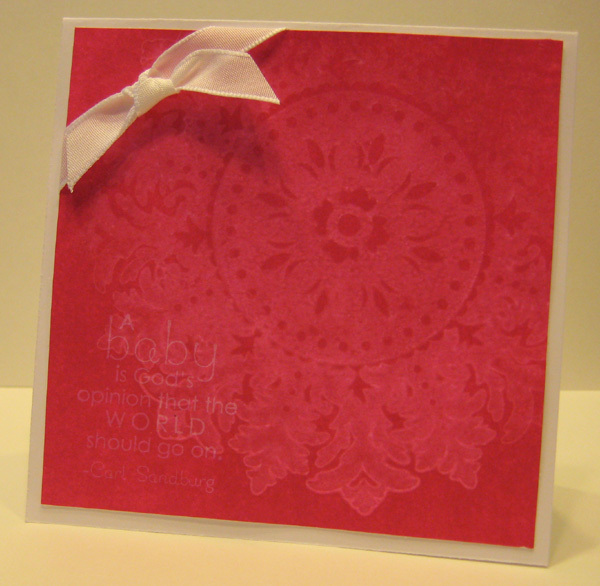 It was first demonstrated at convention by Diana Gibbs, and I knew immediately we would be doing it in stamp club. 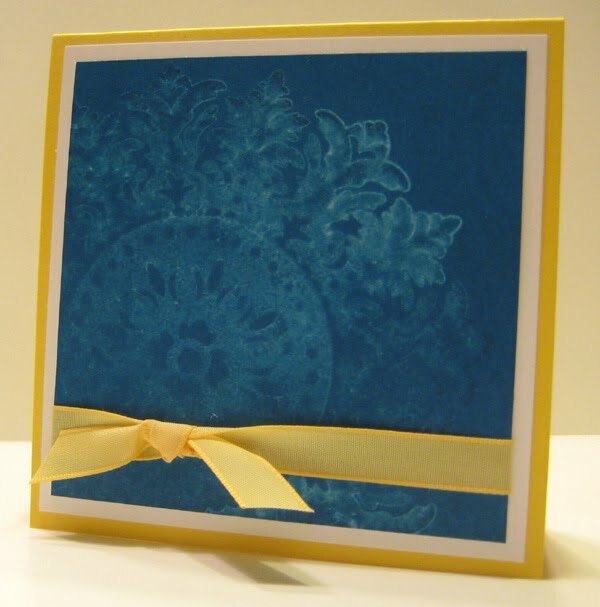 I was also asked to demonstrate it at a demonstrator meeting so I have done some experimenting with color and even stamp sets. I started with dark colors but really found that any color I tried would work. 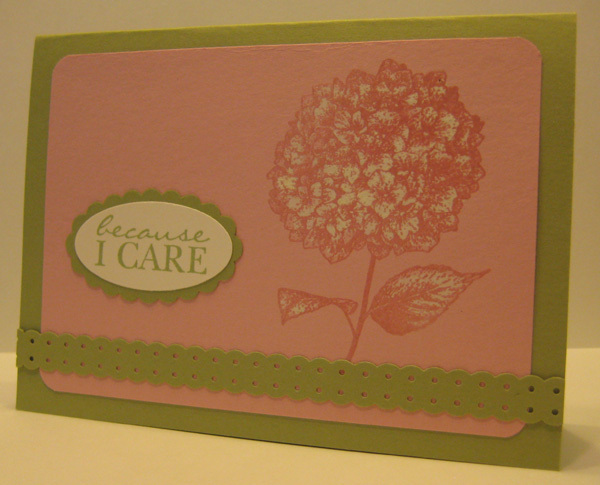 For club, we did a Melon Mambo and Whisper White combination, and I chose to use mine as a baby card. After working with the technique for awhile, I decided to try it with another stamp that had a bigger, smooth surface like the medallion. Upsy Daisy was a perfect set to try. I used Rich Razzleberry and was really happy with the results. Begin by applying the ink directly to Whisper White or Very Vanilla. 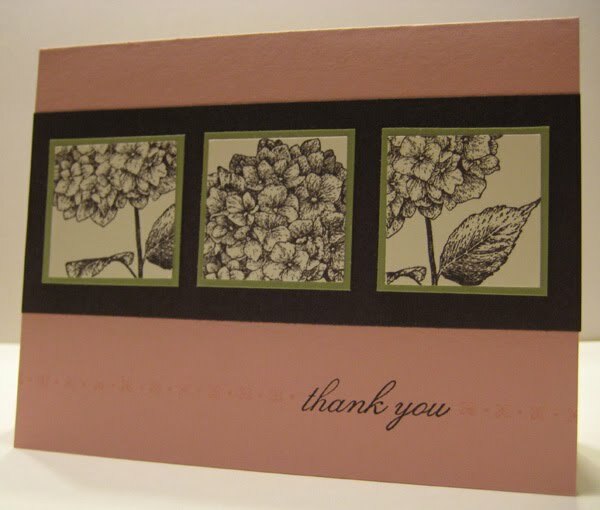 I just tapped and rubbed my stamp pad right on the paper. 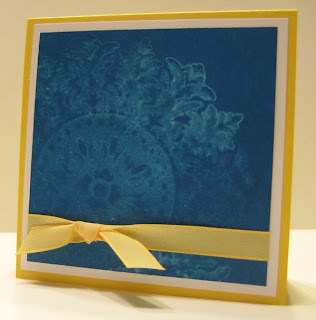 Stamp the medallion with VersaMark, spray it with Stampin' Mist and then stamp it onto your freshly inked piece of cardstock. I found that sometimes I didn't use enough mist which caused my image to be less clear. 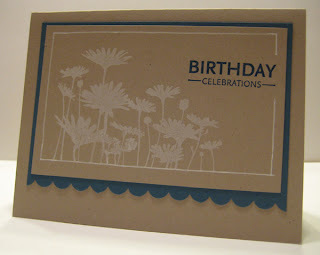 But really it is hard to make a mistake with this technique because you can trim, stamp words or add accessories. I have been having fun trying different colors, and I really haven't found one that doesn't work with this technique. 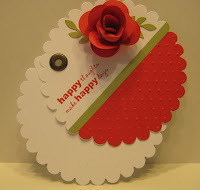 After stamp club tonight, I will post the card we made and the directions for this awesome new technique. Here is a smaller version of the medallion technique card. 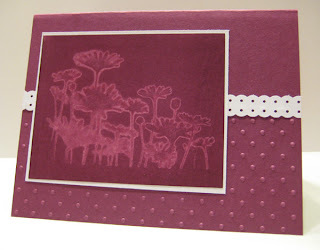 This card is 4 x 4 and is a great way to hide mistakes by cutting them off and only using part of the image. It was also my first chance to use my new Daffodil Delight ribbon with Pacific Point ink - a great new combination. Here is a closer look for those of you who got my newsletter this week. And for those of you who don't, you can sign up in the sidebar for my monthly newsletter with specials, events, tips and samples. 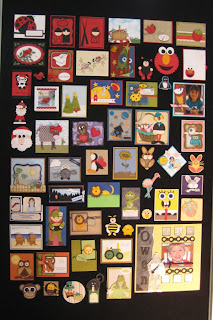 We learned this technique at convention this year and will be doing it in Stamp Club on Tuesday. Check back for more samples and the directions. 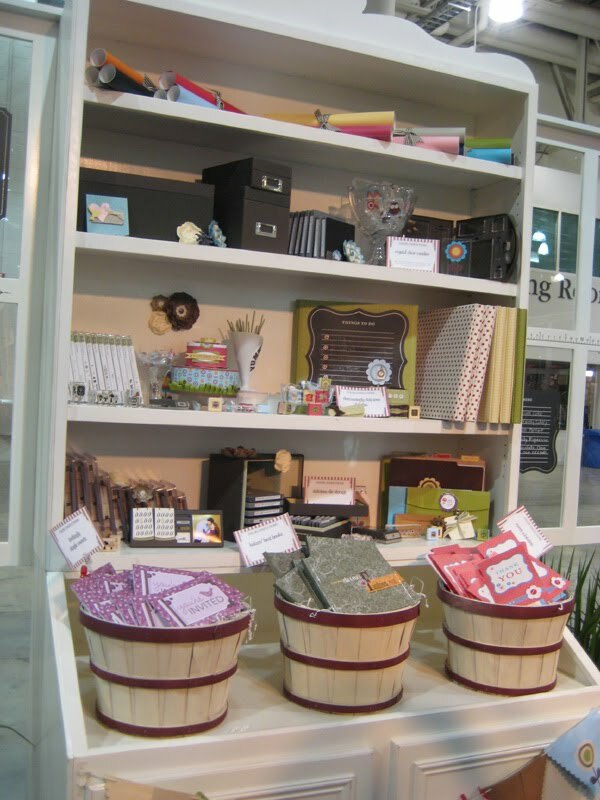 The state of Illinois is having a sales tax holiday of 5% August 6 –15 for all school supplies. What this means is if the sales tax for your city is 6.75%, the holiday is only for 5%. So, you’ll still be charged for 1.75% for state sales tax. Or, if the sales tax for your city is 9.125%, the holiday is only for 5%, and you’ll be charged 4.125%. Because school supply items are included in this sales tax holiday, the below list of items will be tax free during the holiday period. Please note that you must place your order during the tax holiday period in order to receive these items tax free. It seems funny to be talking about Christmas in July when we are well into August, but here is the last Christmas card for a few months. 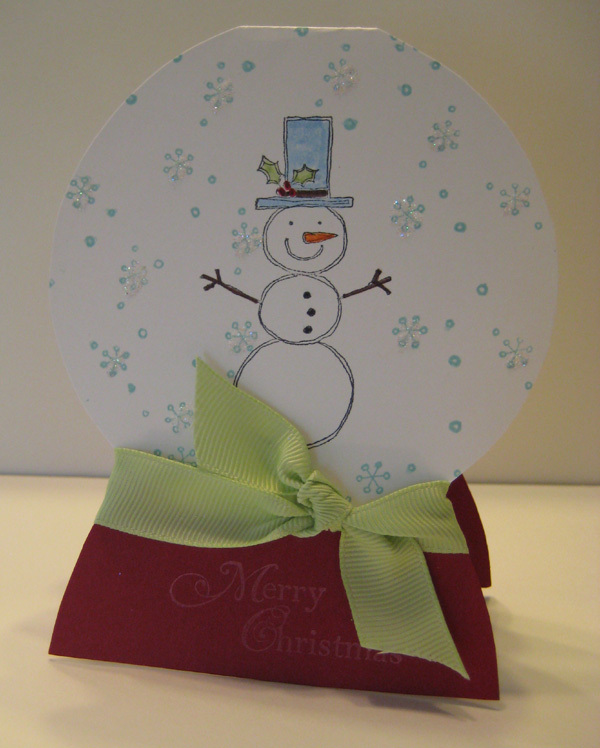 This card was inspired by a card on the convention boards using one of my favorite snowmen from the Punch Pals stamp set. I created a pattern and we did it the old fashioned way and traced it. 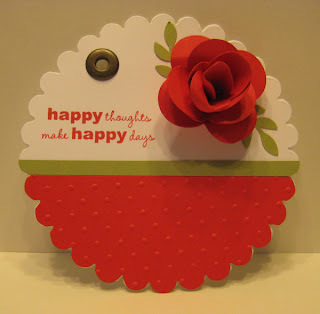 The Cherry Cobbler piece at the bottom is stamped in Craft White, and by gluing in the proper place, it fits into a regular envelope with no problem. Today I have been working on my cards for my Friday and Saturday Stamp-a-Stack so keep an eye out for those in the coming days, and if you want to join us, there is plenty of room. 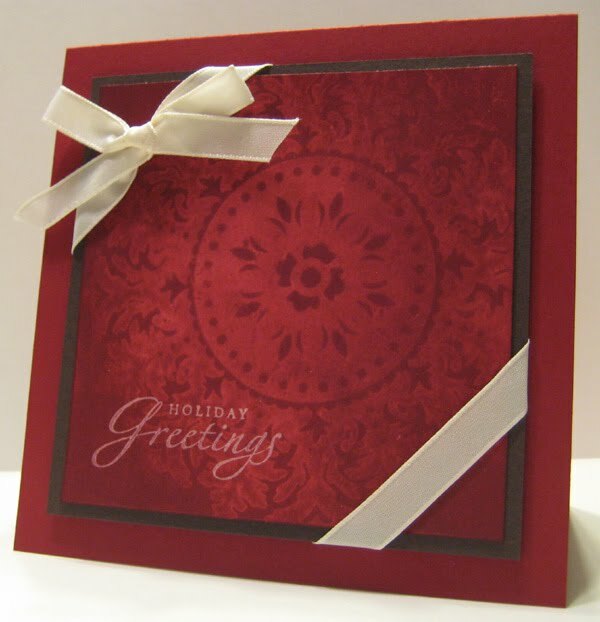 Hostesses earn an extra $25 in hostess dollars this month if they host a workshop over $350. Wow! Think of all of the extra goodies you could buy with that in addition to the hostess money you are already earning on your workshop sales! These benefits don't apply to online orders so schedule a workshop with me today. Too far away? I can send you a make-n-take project to do with your friends and we can arrange for orders over the phone or email - don't miss out on the extras this month! Here is another card from my Christmas in July. 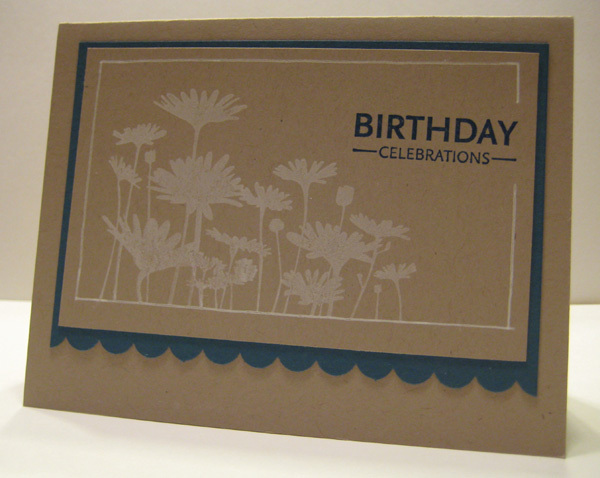 It was a quick and easy card inspired by a card I saw at convention on the display boards. The vertical stripes look great, but several people used the reverse side for a completely different look. 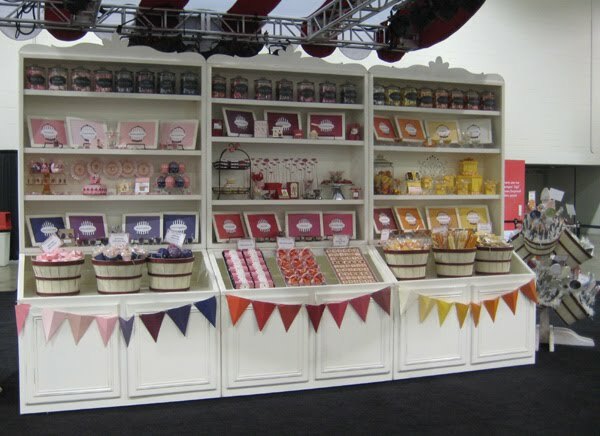 They had this great display in the center and made stamps and ink look good enough to eat, and all around the outside were cabinets featuring seasons and holidays. 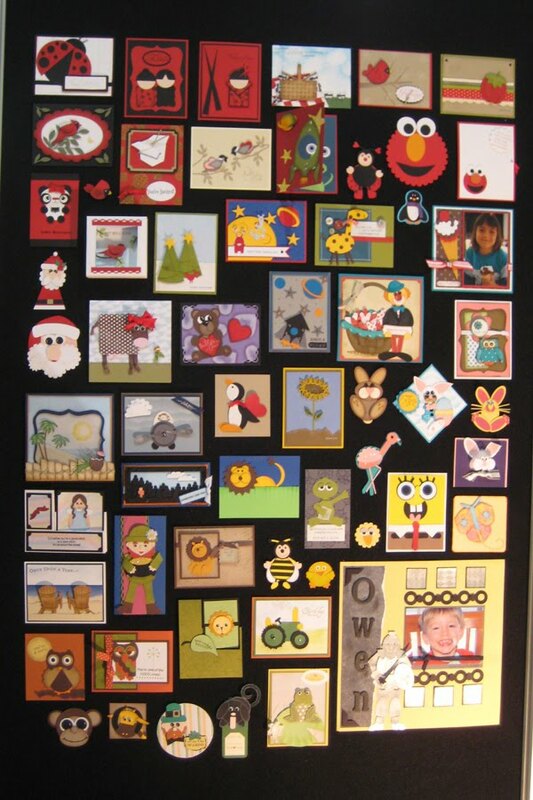 It was so much fun to look at all of this creativity. Now that I am back from convention and "rested", I should be getting back in the swing of posting. We had a Christmas in July Stamp-a-Stack the day after I got home. And since I took my inspiration from some of the display boards, I used a combination of old and new stamps and accessories. 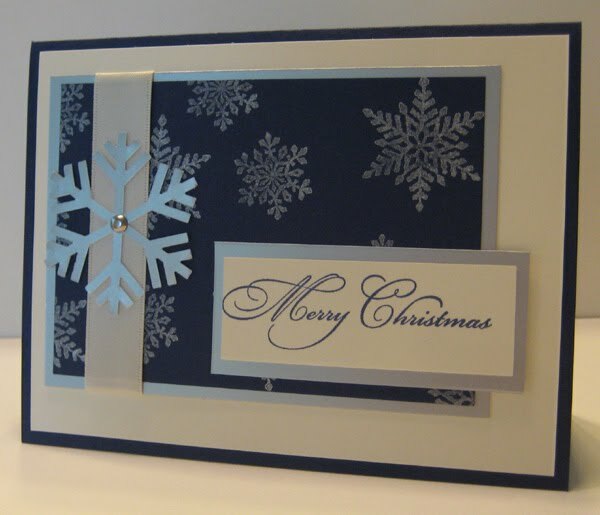 This card uses a pretty old stamp set, but there is a great snowflake set in the current catalog, I just don't happen to have it.